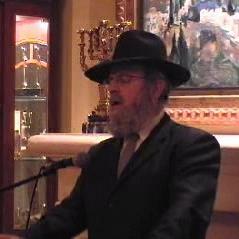 Rabbi Zev Cohen is a talmud of Rabbi Yitzchok Feigelshtok, the Rosh Yeshiva of Mesifta of Long Beach. After learning in Lakewood for 8 years, he became one of the founding members of the Chicago Community Kollel. In 1987 after being in the Kollel for 6 years, Rabbi Cohen became the Sophomore Rebbe in Skokie Yeshiva. He then became the Mashgiach of the Beis Medrash, a position he held for 6 years. In 1988 Rabbi Cohen became the Rav of Congregation Adas Yeshurun in Chicago where he has spearheaded many communal activities, including the creation of the West Roger's Park Eruv. In 1999, he became the Rosh Kollel of the Choshen Mishpat Kollel, which is located in his shul. He is the co-chairman of the Midwest Conference of Synagogue Rabbanim. Rabbi Cohen has made over 150 tapes for the internationally renowned Dial-A-Daf series, and has published a number of articles in both local and national journals.